The key to this salad is garlic — plenty of it. 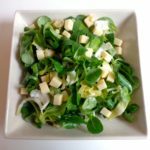 Once you have assembled the basic salad, which takes no more than five minutes, you can enhance it with walnuts, Alpine cheese, cured country ham or all of the above, making it suitable for vegans and vegetarians as well as omnivores. 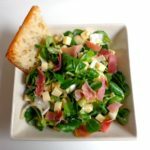 This salad may be served, enhanced, as a first course or lunch dish, or as just leaves and vinaigrette as a salad course after a main dish or as a side salad. You will find a link to the recipe for the mustard vinaigrette below. Thoroughly rinse the mâche (which can contain quite a bit of sand) and spin it dry. Rinse the Belgian endive and pat dry. Slice the Belgian endive crosswise into thin strips. 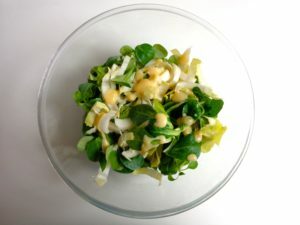 Combine the mâche and endive in a salad bowl. Peel the garlic clove and mince finely. Scatter it over the leaves. Spoon two tablespoons of vinaigrette sauce over the salad and give it a toss. The basic salad is now ready to serve. If desired, add some or all of the optional ingredients. Toss again. Serves 2 as a starter or salad course, and 1 as a main course.